Not entirely sure what this means. Assuming “N Taking” means “number of students who took the AP exam,” we see a 67% pass rate on AP exams (500 exams taken, 336 passing scores). UPDATE 11/23/2013: Assuming the slide above is the same as the slide in this year’s report, “N Taking” means the number of students taking the test — not the number of students taking an AP course. Another 112 exams weren’t taken at all. We don’t know how many of those students would have passed but skipped the exam due to senioritis or other factors. And we don’t know the distribution of 3s, 4s, and 5s, which is especially important in a high-performing district. • What do home buyers want? • What is the Equity and Excellence score? As I recall, New Yorkers receiving public pensions do not pay state taxes. What happens if we increase taxes by 5% every year for 10 years? To meet school payroll and other expenses without layoffs or a cap on raises, we will arguably need something in the neighborhood of a 5% tax increase each year. Unfortunately, very few people are experiencing 5% annual increases in household income. Over time, that’s a problem. 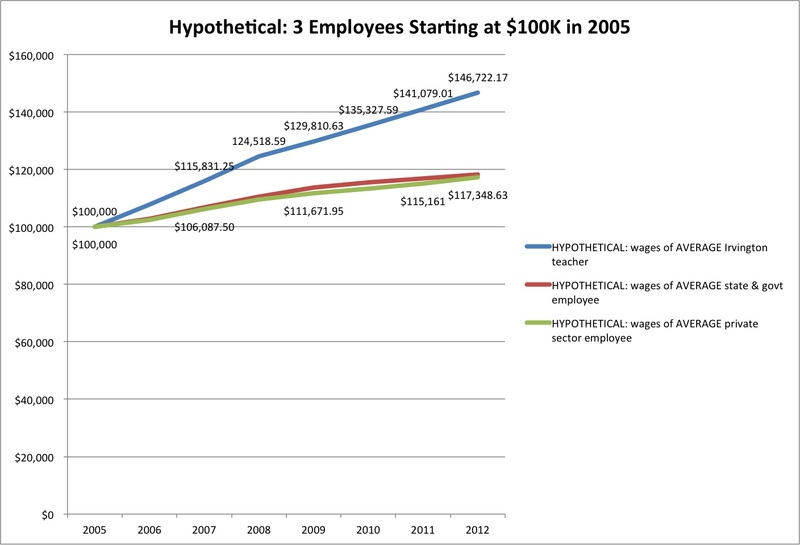 Take a family earning $150,000 in 2012 paying $15,000 in school taxes. Assume property taxes increase by 5% each year, while household income increases by the national average of 2%. In Year 1, this family spends 10% of income on school taxes. Over the next decade taxes rise by a total of 63% while income rises by only 22%, so now this family is spending 13% of household income on school taxes (and their children are taking out loans to pay for college). When people talk about school spending and taxes being “unsustainable,” this is what they mean. The only way to fund Irvington schools at the level we are funding them is to gentrify: the “big rich” will have to move in, and the “little rich” will have to move out. It seems to me that this process has been taking place for some time now. The “big poor,” a term coined by my friend D., need to move to Connecticut. We have a total of 310 employees, including 180 teachers. One employee for every 6 students. While Americans are typically earning less than 1 percent interest on their savings accounts and watching their 401(k) balances yo-yo along with the stock market, most public pension funds are still betting they will earn annual returns of 7 to 8 percent over the long haul…. In New York, the city’s chief actuary, Robert North, has proposed lowering the assumed rate of return for the city’s five pension funds to 7 percent from 8 percent…. 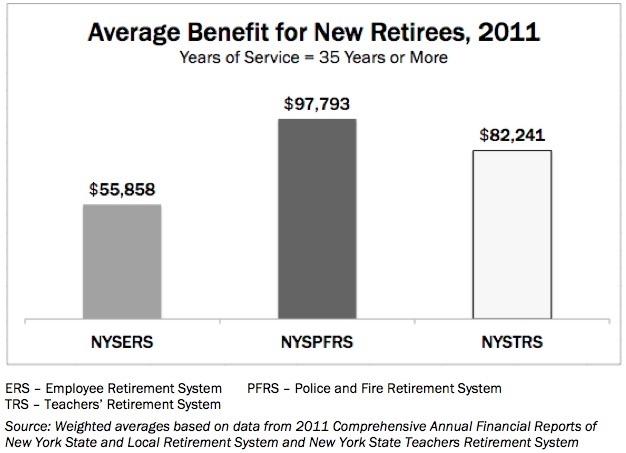 But that change would mean finding an additional $1.9 billion for the pension system every year…. …to many observers, even 7 percent is too high in today’s market conditions. Also, and by the same token, 8 is not 7. The typical public pension plan assumes its investments will earn average annual returns of 8 percent over the long termm…. Actual experience since 2000 has been much less, 5.7 percent over the last 10 years…. 8 is not 5.7, either. The stock market collapse of 2008 decimated public pension fund investments, and municipalities are now being asked for greater contributions to make up for the losses. The impact has been drastic: Three percent of New York property tax collections were used to pay pension costs in 2001; by 2015, pension costs are expected to eat up 35 percent of property tax collections. Earlier this month, we established the fact that 4 is not 2. 35 is also not 2. • School mills, revaluation, etc. Should public schools bet so heavily on ‘technology’? It seems that the share of our economy devoted to information technology is plunging, whereas the share devoted to primary metals production is soaring. In 2000 IT was 2 1/2 times larger than primary metals. Now primary metals is far bigger. We desperately need to retrain Silicon Valley engineers on how to dig up copper in the Arizona desert; otherwise Silicon Valley will soon look like Detroit. People hate to bullet vote. Taxes are capped at two percent, but the contract promises 4. Four is not two. That is the problem. Although “four is not two” is obvious, percent change is not. With percent change, a number that sounds “small” can actually be “large” if it represents a large percent change (and vice versa). Under the Irvington contract, if you pay a teacher $100K this year, you have to pay him or her $104K next year, on average. That is a 4% increase, but we are capped at 2, so you have to find $2K in cuts to ‘pay’ for the raise. Hence: layoffs. Some teachers are laid off so that other teachers can have 4% raises. But if you paid a teacher $1.00 — just one dollar — for an entire year’s work, you would still have the same problem. The contract would require that he or she be paid $1.04 next year, and you would have to find two cents in cuts to pay for the 4-cent raise. Four isn’t two, and four never becomes two no matter how “small” the numbers you’re dealing with. In short, the absolute dollar amount doesn’t matter; it’s the percent change that counts. So the problem isn’t that Irvington teachers are earning “too much;” the problem is that the yearly increase in their compensation is twice the tax cap. The increases are increasing too fast. THAT is the issue, and we can’t ‘cut’ our way out of it. Yes, we can raise class size and save money, but that, too, is a one-time bonus to the budget. We would avoid layoffs that year, but the next year we’d be back to cutting. Yes, we can cut electives. Again: a one-time bonus. In each of these cases, cuts reduce spending, but they don’t fix the rate of increase. As long as we have a union contract in place that guarantees average annual increases of 4%, we can’t meet the tax cap without layoffs. The contract is funded by layoffs. The logic of percent change also means that encouraging older teachers to retire so we can hire much less costly young teachers actually makes the problem worse because new teachers receive Step increases every year (usually 3%), while older teachers don’t. It’s conceivable there is a third option: generate enough revenue outside of the tax levy to make up the shortfall. Perhaps parents could fund raise as they do in California (where property taxes are much lower and must be shared with all schools in the state – very different situation) or the district could rent out Main Street School and increase the rent enough each year to make up the shortfall —- ? * update 5/26/2012: Looking at the terms of the contract again, I’m wondering whether 4% is too low an estimate for the year after next, when the one-year freeze on “increments” (steps) comes to an end. ** Apparently you can “bank” a savings from year to year up to 1.5% (of the budget you would have been allowed under the cap? Not sure; I’ll look it up. I don’t know how the sale of property applies to the budget.) The principle remains the same, however. If you bank a savings, you must use it to pay 4% compensation increases the next year, and the problem begins anew. In a nutshell, “present value” means that to cover these future costs, which we have promised to pay, we would need to put $100,000,000 in a bank account today at an interest rate of 4%. NOTE, however, that state law does not allow us to do this: state law does not allow us to fund (save money for) the benefits we’ll be paying. By law, we are required to pay-as-we-go, which means that future parents and non-parents alike will have to pay out that $100,000,000 (and the figure will be higher when residents pay it, of course, because future taxpayers won’t have the 4% compounding interest they would have had if the money had been saved and invested). I’m going to fact-check this post and come back to it. Here’s a quick back-of-the-envelope calculation to estimate the shortfall we face in 2013-2014. Assuming no change to “Other” expenses (which is probably unrealistic), I come up with a $610,000 shortfall. Personnel is 80% of the budget, so If the union does not agree to cap raises at 2%, that would mean roughly 6 teachers laid off in order to fund 4% raises. Obviously, these are very rough calculations, but they’re not a bad place to start. FTE = full-time equivalent Essentially, 1 FTE = 1 teacher. My sister says that a bar graph is much clearer than the line graphs I used in my first post. I think she’s right. The issue here isn’t the absolute amount of IUFSD compensation — but, rather, the speed with which it is increasing. Employee compensation can’t go up faster than taxpayer compensation forever. It’s unsustainable. A growing gap between teacher and taxpayer wages? What’s important to notice here is that Irvington teacher wages, which will increase at an average rate of 4% a year for the next 4 years, are likely to pull away from taxpayer wages. If that assumption holds true, the gap between the blue line on top and the green and red lines down below will grow wider. I don’t have a figure for average teacher salary in 2010. I’m guessing it was around $89,000. How does an individual income of $89,000 compare to a household income of $99,265 or $113,840? I don’t know the answer, but I suspect that median household income of Irvington teachers is higher than median income household of IUFSD residents. * I don’t have a median figure for Irvington teachers. The problem we are having with the school budget is that the average increase in teacher compensation is 4 percent, while the tax cap is 2. • Do IUFSD teachers earn more than IUFSD residents? * Lane increases are raises received upon completion of further education. Most lane increases are 5%. The district has 310 employees in all, of whom 180 are teachers. The general rule: if you want to work for 50 years, retire for 20, maintain your expected standard of living, and expect a 5%/year real return on average, then saving 7% of your income should do it. If you want to build up assets–to work for 50 years and then live off your income and hand down your capital to your descendants–it is, of course, harder, but saving 14% of your income should do it. The key is (a) start early, (b) continue, and (c) don’t trade with people who know more than you do. In terms of school spending, what’s significant about this passage is the fact that employees hired before July 27, 1976 will receive pension payments that amount to something in the neighborhood of $2,500,000 all told – 2.5 million dollars – along with free health care for life (no co-pay) without having had to save for retirement. Employees hired after 1976 had to contribute 3% of their salaries for 10 years. Quick note for people who feel they’re not good at math: These graphs show the percent change in people’s wages from the year before. 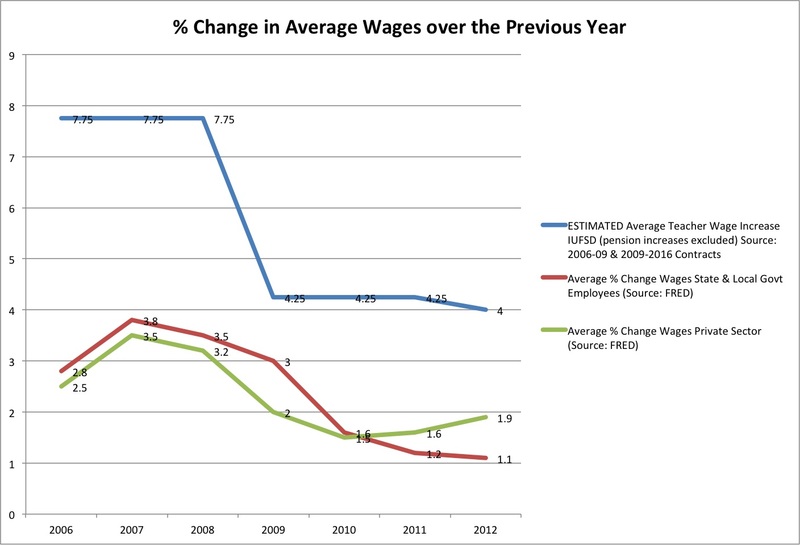 The figure 7.5%, on the left side of both graphs, means that in 2006 the “average” Irvington teacher received a 7.5% increase in salary over what he or she earned in 2005. That same year, the “average” employee of state and local government received a pay increase of 2.8%, while the “average” private sector employee received an increase of 2.5%. Suppose it’s 2005, and we have three workers: a teacher in Irvington, a person working in the private sector, and another person working for state and/or local government. Let’s say that each worker earns $100,000 for that year’s labor. Irvington teacher now earns: $107,500. After just two years, the Irvington teacher is pulling decisively ahead of both the private sector and the government employee – and this difference continues to compound over time. Arguably, the two graphs above tell our story. First of all, by way of background, until very recently no one knew what the average teacher compensation actually was. Proposed budgets were extremely difficult to decipher, and the district flatly refused to tell voters – or the one board member who asked – what the average teacher was being paid. Contracts had to be FOILed, and the salary schedule was not published. Average teacher salary was the one figure many people needed in order to make sense of the situation. Most of us aren’t accountants, and the arithmetic of percent increases and compounding over time isn’t intuitive. Prior to the crash, the district was paying salary increases to teachers that were in all likelihood far above the salary increases many or most Irvington taxpayers were receiving. After the crash, in a depressed economy, the district is still paying salary increases at least double what workers in the private sector are receiving (assuming they still have jobs) and nearly 4 times as large as the increases government workers are receiving (again, assuming the government worker still has a job). 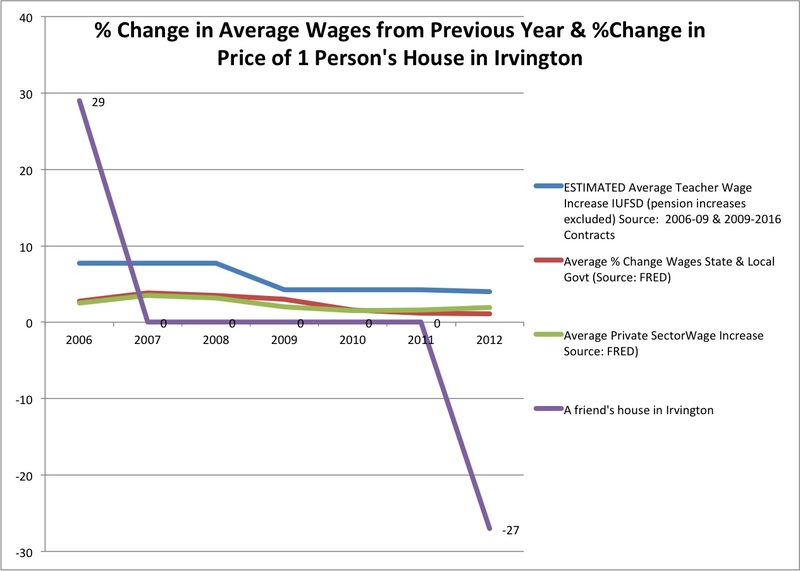 Irvington voters may have failed to notice just how large the district’s annual pay increases were in part because the annual increase in home value was even higher. We were in the midst of a boom, and (almost) everyone was getting richer. The financial reality of district budgets failed to register on voters (and the details of the budget were obfuscated by the administration). The crash changed everything. Home prices are now far below the level they were when voters were funding 7.5% wage increases and voting ‘yes’ on bonds. For their part, although Irvington teachers are still receiving annual raises double that of most taxpayers’ annual raises, they also, between 2008 and 2009, suffered a far steeper drop in their annual wage increase than private or government workers: from 7.5 to 4.5 on the day the 2006-2009 contract expired. Their increase decreased more. That matters greatly. People make financial decisions on the basis of projected future income, and suddenly, virtually overnight, teachers’ projected future income changed dramatically. Thus teachers feel they have made unprecedented concessions during negotiations for the new contract, while taxpayers feel they can’t afford to fund 4% pay increases when they themselves aren’t receiving anything close to 4% pay increases and the value of their homes has tanked.